Für einige zusätzliche Optionen (z.B. Standbild erstellen; FullScreen-Mode) kann eine Pro-Version der Software für erworben werden. A free and smart Flash movie player. It is the only stand-alone application for Mac OS that is able to playback SWF and FLV files with plenty of bonus features. It provides handy movie controls, that let you play, rewind, fast-forward and playback movie files frame-by-frame. SWF & FLV Player will browse any web addresses to discover and save all SWF files it uses. If any SWF file requires external resources (it may open and play other SWF or FLV files, load images, etc) SWF & FLV Player will inform you about it and offer to download all the external resources required as well. SWF & FLV Player also lets you create and manage playlists – play FLV and SWF files randomly or one by one, repeat one item or the whole playlist, save playlists so you can load your favorite movie collection later. 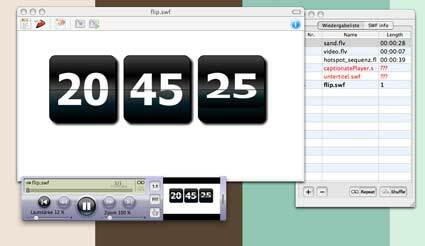 With SWF & FLV Player you can zoom in the movie to see the specific part of it, fit to current window size or restore to original one. Many more features. Die aktuelle Version 3.5 vom Oktober 2007 ist jetzt auch mit dem Webkit von Safari 3 kompatibel. 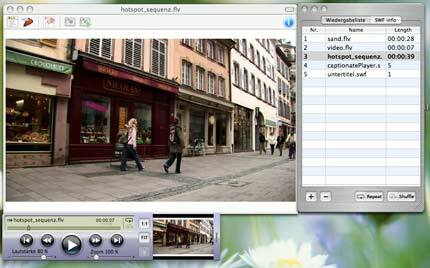 3 Kommentare zum Beitrag "SWF & FLV Player für Mac OS X"
Der kostenlose SWF & FLV Player for Mac ist nun in Version 3.6 verfügbar. Super, herzlichen Dank für den Hinweis, genau so etwas hatte ich gesucht!